On Wednesday, teachers across North Carolina plan to take personal leave to march on the state capital in Raleigh, protesting low wages and overall inadequate education funding. More than 40 of the state’s school districts (representing two-thirds of all students) have decided to close school for the day due to an overwhelming number of personal leave requests and to show support for educators. Their action follows formal strikes and protests in five other states — Arizona, Colorado, Oklahoma, Kentucky and West Virginia — that are contending with similar challenges. 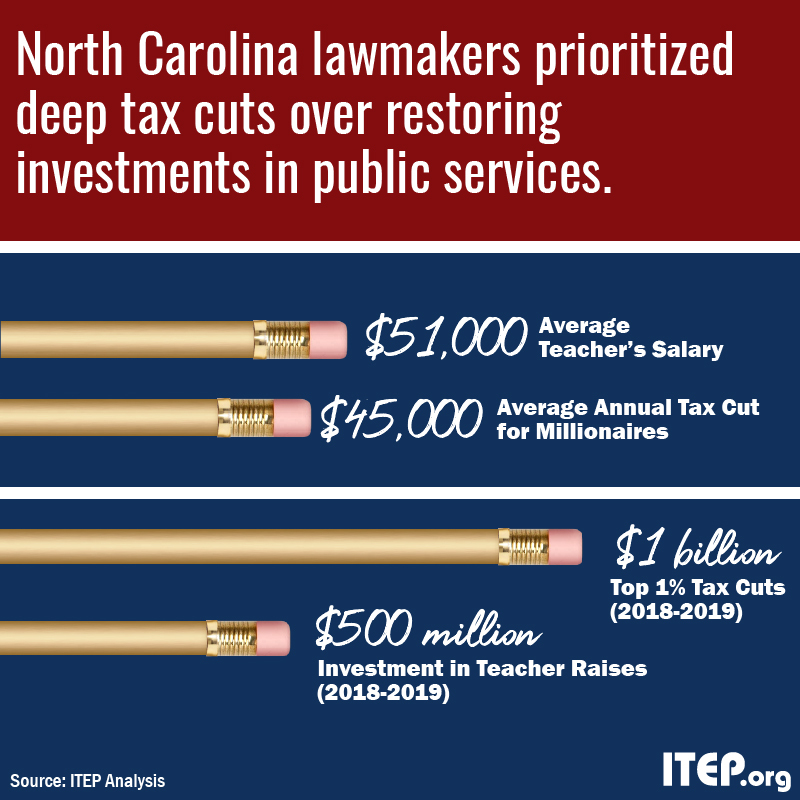 In recent years, North Carolina lawmakers have prioritized deep tax cuts to the tune of $3.5 billion annually (once fully phased-in) over investment in schools and other public services, cutting taxes four times in the last five years. 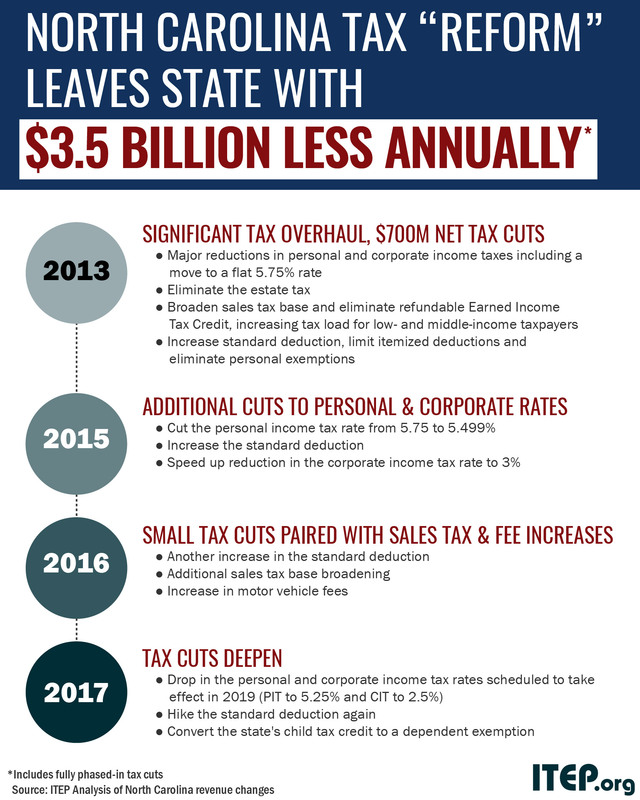 Worse, the tax cuts have largely favored the wealthy and profitable corporations while attempts to raise revenue, such as broadening the sales tax base and moving to a flat-rate income tax, have shifted more tax responsibility onto low- and middle-income families. A common argument lawmakers make when explaining why their tax cuts disproportionately benefit wealthier taxpayers is the claim that they pay a greater share of taxes. And they do pay more in real dollars, but that’s simply because they have far more income. But, North Carolina’s tax system — just like every other state tax system — is upside down, meaning it captures a greater percentage of income from the poor than it does from the rich. 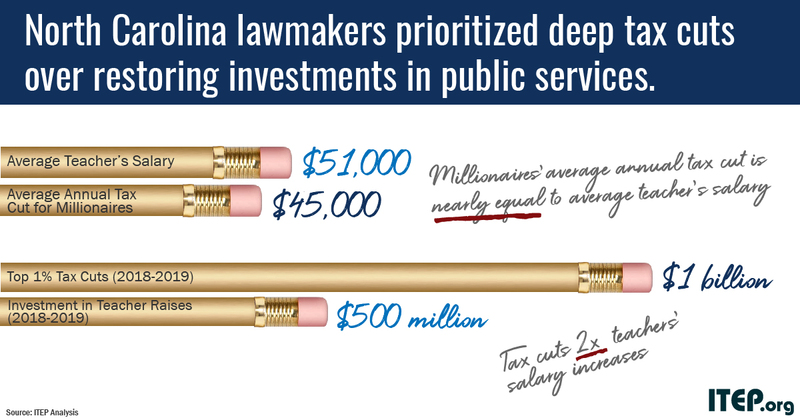 Further, the state’s recent tax-cutting policies have exacerbated this disparity. The top 1 percent (with incomes starting at $500,000) received more than a third of the recent total tax cuts, though they only pay 22 percent of the state’s income tax. During fiscal year 2018-2019, lawmakers plan to invest $500 million into teacher raises to help bring their wages on par with the national average (these changes were agreed to last year as part of a two-year budget package). 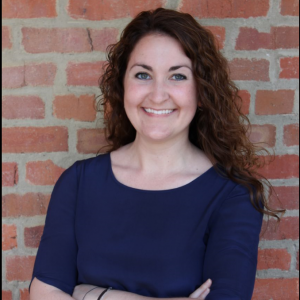 This is an important step forward, but still is not enough to resolve the disparity in teacher pay and deep cuts in education funding that have occurred since the most recent economic recession. The investment also pales in comparison to the $1 billion in tax cuts the top 1 percent of North Carolinians will see in 2019. Despite moderate raises in the past few years, the reality is teachers are still earning less than pre-recession wages. The average annual salary for North Carolina teachers currently remains nearly $10,000 below the national average. 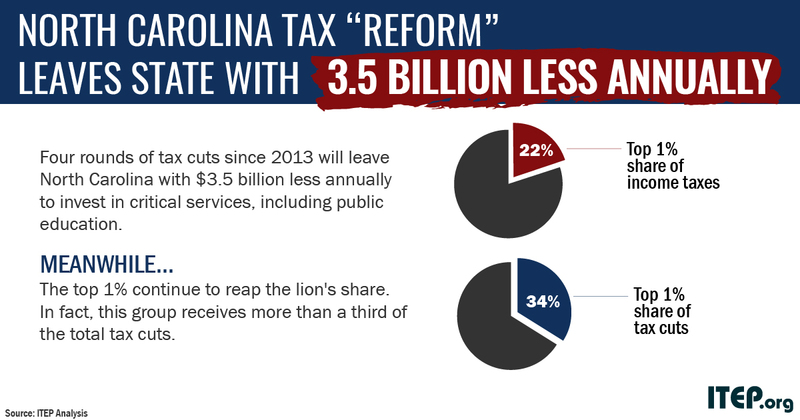 Many lawmakers and anti-tax groups have held up North Carolina as a model for cutting taxes and also growing the economy, but that narrative is a ruse. 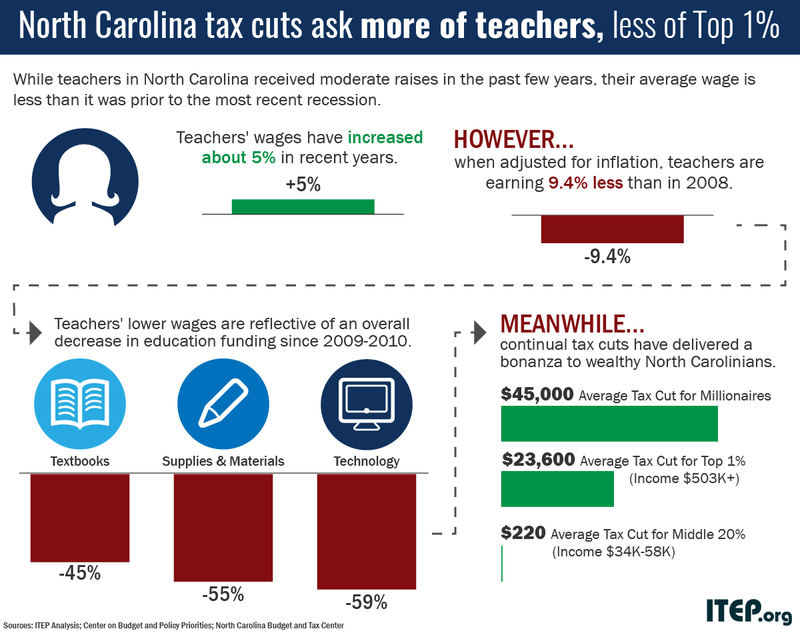 As some look to North Carolina as a model state, educators’ frustrations are symptomatic of tax policy that favors the top 1% over the average taxpayer. The consequences of regressive tax policies will continue to reveal themselves in states and communities that value public services, such as high quality public education, over tax cuts for the wealthy.